It’s nice to see lighthearted news about Pokemon GO. It’s refreshing when a city embrace the sensation of Pokemon GO too. Far too many news articles focus on the ones condemning it. Luckily, many places are hopping on the Pokemon GO fan train for customers and community involvement. One such event coming up soon is at the Dallas Arboretum in Dallas, Texas. 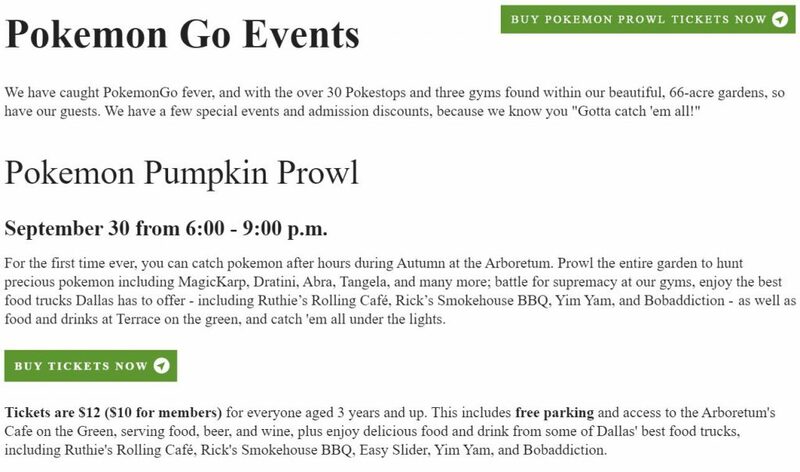 On September 30 from 6 – 9 pm, the Dallas Arboretum is staying open after hours to host a Pokemon GO event. The park includes 3 gyms, over 30 Pokestops, and several nests for players to use. Also, plenty of food trucks will be on hand as well as the Arboretum’s own restaurant. The tickets are $12 each. If you’re interested, check out their site here. It's been too long, but Pokemon GO Plus has finally been released. The wrist acc..